Aishoplan Nurgaiv is a thirteen year old girl in Mongolia who dreams of being an eagle hunter, a tradition in their nomadic community that is usually passed down from fathers to sons. But with the help of her father, who believes that girls can do anything boys can do, Aishoplan learns the ancient art of training eagles, mainly to hunt foxes for fur, and becomes a master in her own right. Beautifully filmed, with drones offering sweeping flyovers of the gorgeous vistas and a few GoPro shots that thrillingly put us right in on the action, The Eagle Huntress is an uplifting populist documentary that offers an enjoyable glimpse into this traditional way of life. Now I do have to mention the growing accusations that parts of the film were staged or manipulated in favour of crafting a stronger dramatic narrative, and some of the sequences really do feel too perfectly composed to have been captured entirely on the fly. The narration by Daisy Ridley also feels somewhat needless, seeming more like an afterthought to add star power to the film. But the main subject’s arc of proving herself in a male-dominated field is inspiring nonetheless, and The Eagle Huntress plays as a mostly rousing female empowerment fable, bolstered by some truly breathtaking cinematography. 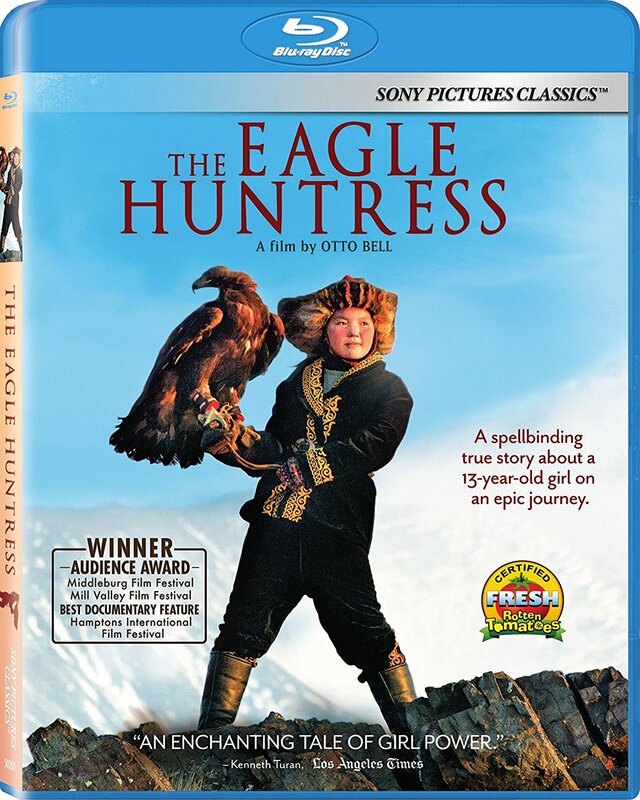 The Blu-ray also includes a commentary track by director Otto Bell, as well as a “behind the scenes” featurette entitled Capturing The Eagle Huntress. The Eagle Huntress is a Sony Pictures Classics release. It’s 88 minutes and rated G.